Prepare! Laying the groundwork for equal employment | Prepare! Laying the groundwork for equal employment – European Youth for Action! In 2018 EYFA supported a diversity of small-scale workshops and trainings. Youth groups engaged in economic justice work, expanding access to employment, and building sustainable economic alternatives had access to requesting the support of experienced trainers from our network. Flexible one-off support to develop and create the skills to identify intersecting discriminations, economic exclusion, and how to access their social rights to employment remains our priority in this activity. 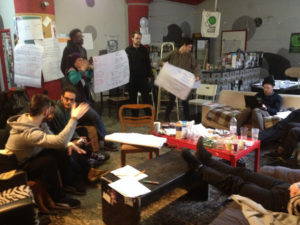 This activity aimed to supported the participatory process of building local structures against social and economical exclusion by developing the ability to identify and challenge existing barriers. The workshops we did were mostly focused on tools for economic inclusion, but tackled the problems for many angles – from raising the awareness about youth unemployment, through combating discrimination in the work place, till forming or developing self-organized work spaces. Additionally, this activity was designed to spread non-formal education, peer-to-peer learning, make new connections and empowers grassroot activists in their journeys towards social, economic and environmental change. build networks and solidarity to combat intersectional discrimination, social and economical hierarchies. new workshop modules about alternative economic models, cooperativism – its challenges and potentials and anti-discrimination tools in self-organized work place. This project was made possible with the financial support of the European Youth Foundation – Council of Europe.